Available from Barrier Group , traffic calming rubber speed humps have been specifically designed for applications where traffic speed needs to be controlled, but a standard speed hump is not appropriate. These rubber speed humps feature smoother approach and departure angles, meaning that a wider range of vehicles are able to pass over them. Traffic calming speed bumps have a solid rubber construction, meaning they are capable of withstanding heavy traffic. The shock absorbent rubber is also quiet and simply confirms to uneven surfaces. 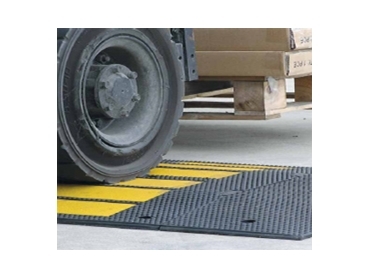 The safety yellow insert is anti-slip and helps to improve visibility and pedestrian safety. The convenient modular speed hump can be configured to any length required and the fixings are concealed, yet they remain fully accessible. All fixings are supplied with these traffic calming rubber speed humps.